Welcome back to Tribal Apocalypse, the PRE where boredom shouldn't be an option. The regular weeks where we play Tribal Wars as it should are increasingly less and less interesting to talk about, because with Elves and Goblins and Humans not having many other outlets (or at all), these became the weeks where they all gather together to annoy each other to death with obvious builds and predictable wins. This isn't to say that they shouldn't take the chance to shine (or whatever they do when they win; I'm more inclined on seeing them as old, tired gamblers going home happy after taking a $2 jackpot). The resulting commentary is inevitably short on topics, though. Hey, did you see that guy Ezuri? You ramp with your Elves and then... oh, forget it. And not much is happening in the Tribal world these days. Theros has entered the picture, but it's kind of specific-tribe-focused, as expected, and not a lot of Theros cards are that good for the older Eternal formats anyway. We're looking forward to Commander 2013 as the new eternal set, and the 51 new cards have been all spoiled now. There's some good stuff, but most of it is multiplayer-oriented, with a political, group hug side, or exploiting new design spaces like the Command Zone and the number of times a single legendary creature has been replayed, which, heh, that's not going to affect Tribal Wars, is it? There's a few interesting additions to some tribes, like, this Rhino is going to be useful, right? There's an Angel that exiles cards from one graveyard, a Djinn that exchanges control of two creatures, and also a cool, new Kobold-making Dragon. Which reminds us that next week on PureMTGO is Dragon Week! An entire thematic week all devoted to the beloved flying lizards! Woot! Every day one or more articles about Dragons from regular PureMTGO writers. I'll do the Dragonpedia, of course. I'll also try and have a Nicol Bolas, Planeswalker as a special prize for the free tournaments I run during the week (it'll be Halloween at Tribal Apocalypse, but hey, Nicol Bolas likes Halloween). Which is also a reminder that Modern Times has just started (this past Wednesday, but it'll be on Thursdays from now on), so if you're interested in that sort of things, come have a look. Second win of the year for the Goblin tribe (of course, now that they're only playable once per month their winning ratio was bound to decrease, just like for Human and Elf), but first win ever for Gq1rf7, here at his 50th Tribal Apocalypse! Congrats! Of course, we've seen this kind of build a lot, and we also know it's very budget-friendly, but it's due some recognition. I like to point out how you can do aggro Goblins in two slightly different ways, one more creature-based, and one that takes a page from the Burn archetypes, and focuses more on winning through damage to the dome. Gq's build belongs to the latter case, with Price of Progress being a highlight, as in a Legacy environment casting it can easily mean 8 instant damage for 2 mana. Ouch. We had a 3-way playoff with romellos and his Junk Humans going directly to the final battle, while Ranth's Delver Wizards were stopped by the burning aggro power of the Goblins. But hey, legendary tribal player Ranth was back in the field! Welcome back! Among the Top 8, I had already featured this Elemental deck by Heureka, but I want to feature it again, because I like it a lot, as I happen to like most of Heureka's ideas, and because it's one of the first cases where we see the Theros Temples. Are they gonna become first choice for duals among budget and semi-budget players? Or something more? Well, they sure sport some gorgeous art. Finally, and speaking of Theros, Satyrs made their debut this week after the Gods did last week. And once again, it's AJ_Impy's handiwork. Let's make a toast with red wine to him and his caprine hedonists! (While Nymph and Octopus are still waiting their first time). Nothing more to say here than, damn those Goblin decks are cheap to build! When your top money card is $0.28 (and that's Price of Progress from I don't even remember which Theme Deck, "Fire and Lightning" maybe?) you know you're not going to be called a big spender. This is the new cheapest event winner, guys. So, since there wasn't really much to show this week, let's go back a bit and showcase a cool, nasty deck that we didn't really see in action yet: justcanceled's Spirit Storm that won Tribal Apocalypse 143. Here's Round 2 against elultimoyoye's Elementals. Check the complete archive of Show and Tell here. TRIBAL LAB: THE INSECT PROJECT! The Insect Project has reached its first culmination last week when I managed to end undefeated with them. It's not its end, because they still need to properly win an event, but they may lay low for a while until their first attempt. After all, we now know a lot about them (a lot more than we wanted to, probably), and Tribal Lab doesn't exist uniquely to showcase their attempts to get to the top. In fact, I've a new conundrum to discuss, and that's Gorgon. Theros gave a considerable boost to the tribe (here's to hoping the rest of the block will continue on this path), which now has 11 members online (plus Infernal Medusa, which, heh). Let's quickly review them, in order of CMC. Reaper of the Wilds: This is the most important new Gorgon from Theros, for starters because it's the cheapest, mana-wise. But it's also a very solid creature, with a good body and a nice set of abilities. It's not preposterous to envision her being played in non-tribal decks, especially in Standard. 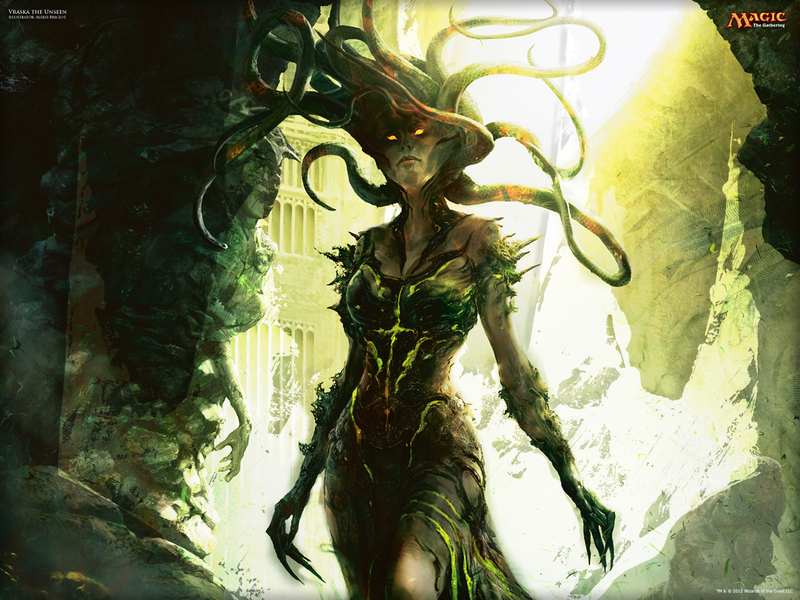 Should be a full playset in every Gorgon deck, which brings us to the first two important considerations about the kind of deck the Gorgons can build: 1) it's going to be a Golgari deck; 2) it'll be at the very least midrange. Gorgon Recluse: Only good if you include a discard outlet, to exploit the madness. Even in that case, not exceptionally good. Her sort of deathtouch kills first strikers and protected too. Not a lot, but something to be noted. Keepsake Gorgon: The monstrosity cost is really overcosted, as monstrosity often is. You get one Murder for 7 mana? And she has deathtouch and good toughness, but power 2 is really underwhelming for 5 CMC. The low power is a general concern in the tribe. Korozda Gorgon: This is exactly like Keepsake, except for the Golgari colors and the monstrosity replaced with a nicer ability. Yeah, too bad it's an ability that interacts with absolutely NOTHING in the tribe. It's a weird design, tribal-wise. As it is, it's pretty much useless in a Gorgon deck. Masked Gorgon: Speaking of useless stuff... I used to consider this sort of a joke to be instantly dismissed. After all, c'mon, you're giving half the deck the chance to block her scot-free and forever. Well, actually not forever, once you get threshold. And maybe your deck is going to get threshold quickly? Plus, she has the second best body and power in the tribe, for the cheapest cost. That might count for something. After all, you might even not meet white and/or green decks every round, no? Pharika's Mender: Another strange take on the Gorgon, but some variety is certainly useful. She does a limite Eternal Witness impression, but for 5 mana and with a very bad body attached (toughness 3? Seriously? ), She doesn't even have deathtouch. All in all, it's hard to understand why this card is a Gorgon. Jury is still out about her possible use in a Gorgon deck, given that CMC 5 is kinda crowded. Although, and that's one of the main issues, none of the many Gorgons at CMC 5 really feels like a sure thing. Hythonia the Cruel: With Hythonia we enter Titan-man territory. Is she worth it? She might, but to activate that monstrosity-enabled Plague Wind you really need something like a Cabal Coffers base. Entomb/Exhume her is absolutely pointless. Visara the Dreadful: She's still the best Gorgon. The only flyer (they probably realized at some point that making a Gorgon fly wasn't really much in flavor), great body, excellent ability with no half measures. Only problem is that she's not protected against removal. None of these Gorgons are, which makes the reanimation route a bit hazardous. Xathrid Gorgon: She does what Visara does, but worse. Worse body, no evasion, higher activation cost, the target remains on the battlefield and can still block. Very flavorful, though, possibly the most flavorful. And there might be a (rare) case where you want to turn one of your creatures into a colorless blocker, to work around protection. Damia, Sage of Stone: Damia's drawing ability is certainly powerful. Not that a Gorgon deck will empty its hand that quickly. But you can take a massive discard route, reanimate Damia, draw a fresh hand of cards. It's definitely a strong member of the tribe. The blue in the cost calls for a splash, though. Sisters of Stone Death: If the Sisters stay on the battlefield, they take control of the game, especially against aggro. Two issues: they need a LOT of mana (even after they've been cast), and they get a big target on their back as soon as they come, and can't do much against it. I tried Gorgon two times so far, the first long ago, before Theros was even announced (if not conceived). Poor results in both cases. The latter was last week, with this deck I envisioned just as a way to re-acquaint myself with the tribe and its new members. I used Liliana to try and exploit Gorgon Recluse. Not sure if that's really worth it. Liliana wasn't protected enough, so she ended up often being an edict effect for 3 mana, like she can be in the wrong deck. My previous attempt with Gorgons was more strongly based on reanimation, with full playsets of Entomb and Exhume on top of Liliana and (Animated Dead) (and I had 4 Damia and 4 Sisters at the time); but what do you even reanimate with Gorgons? Turn-2 Sisters of Stone Death is strong, but doesn't even get to use the abilities much. Visara, sure, or Damia, but they'll get probably killed very quickly, so you'll end up just 2-for-1 yourself (or 3-for-1 if you count that you also fetched — and lost — one of your creatures). A heavier Cabal Coffers build seems like the right route to take here, as risky as it might be. What also I got from this attempt: Keepsake Gorgon is very bad, Reaper of the Wilds is very good. Now, if anybody wants to chime in and gives some opinions and ideas on how to build Gorgon, either in the comments or in form of a larger piece that I'll publish next time (just send it to me at my gmail address you find in the video replay guide below), I'll be happy to discuss them further and maybe play with them in an event and see how it goes. Let's keep an eye on the Gorgons. So to speak. The Up-and-Coming Prize is now 3 tix! So go find a tribe that never won an event (the Unhallowed list) and try and be the first to break it! The Tribal Achievements: Welcome to the second season of the Tribal Achievements! Find new ways to have fun within Tribal Apocalypse, challenge yourself to complete all kinds of strange MTG feats, and make some tix in the process. The Hamtastic Award: The Biodiversity Prize dedicated to the memory of Erik Friborg has started again, for its 8th edition: be the first to run 10 different tribes in a row and you'll get 5 tix on SBena_Bot! You have to play all the rounds of an event in order for the tribe to be added to your sequence. If you repeat a previous tribe, your whole sequence resets. The Mongoose Pride Prize! As the last tribe standing after everyone else had been played at least once, Mongoose has become the protagonist of a dedicated prize that will remember forever that you all neglected them despite Nimble Mongoose being featured in high-profile, tier-1 Legacy decks. The Mongoose Pride Prize will permanently award 1 tix (at SBena_Bot) to everyone who'll just... play Mongoose. That's right, you just have to play them and you'll get 1 tix, till the end of times. Well, there's just one clause: you have to win at least one match with them within the event (byes and forfeits don't count). Let's show them all what the mighty Herpestidae can do, shall we? The Champion Challenge is all new! Every time a player who's not currently Top 16 will end up X-1 or better in any event, they'll get the right to challenge one of our Tribal Champions, if available (they can try and find one next week, too). Winning that challenge means getting 3 tix on SBena_Bot and 10 bonus points in the seasonal leaderboard. More so, the Champions will have to answer the Challenge with a predefined deck, which you can see here, along with the complete ruling. The Top Players Lockout: Every time a Top Player (either a Google Era Top 8, an Ultimate Champion or a seasonal Top 8) will end undefeated, they will not be allowed to register the same tribe and deck again for 5 events (i.e. they'll have to register a different deck or decks 5 times before coming back to the undefeated one). With "deck" is meant a specific, recognizable archetype (e.g. Wall-Drazi), which in some case will be linked to a specific combo card (e.g. Helm of Obedience). A list of the current lockouts is maintained here. Check out the full Tribal Calendar for 2013! Take the Quick Survey about the ban list and the event rotation! I'd like to unlock Nymph or Octopus this week. Sadly not possible because any tribe with less than 11 members is unplayable in Singleton, which tends to lead to the problem you outlined above first thing with the big, redundant tribes dominating. But this is old ground. Gorgons! I've built them several times over the years, most recently in July 2011, during the Blippy-run Blippian era. At that time, we'd just hit the 5 Gorgons necessary to run the tribe without changelings, thanks to Damia. However, this meant the deck included Masked Gorgon alongside the three legends and Recluse. Deck used Sickening Dreams as its discard outlet for madness and refreshing Damia, with a reanimation suite for the fatties. 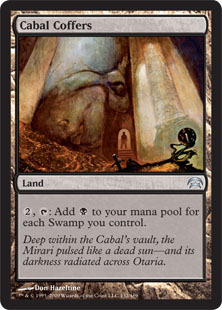 Mana base was swamps, fetches and Coffers, with the rav duals colourfixing. I'd probably trash it completely and start again with the new guys. Still reanimation, because high casting costs, a madness outlet and some decent fat lends itself naturally to that. The legends would still be the mainstays, probably a coffers engine and both monstrosities. Big removal suite. Are Gorgons Spooky? "Every day one or more articles about Dragons from regular PureMTGO writers. " I assume this was supposed to end in "Will be posted here."? Sure. Verb phrase ellipsis construction. I did the same in the previous sentence. Here and in the article. I missed it! (Busy week). I'm going to read/comment your article now. And I don't seem to have your email, so drop me a line at aicardigianluca at gmail.com, you can still join the Dragon fun if you want. Everybody can. Would a couple of copies of Vines of Vastwood help? Eh, that doesn't allow for a turn-2 Exhume, though. 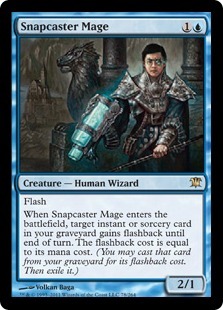 It's also the kind of card that I always struggle to include, as it's situational and can be dead in certain matchups (although that's less true of Vines than of other things like Apostle's Blessing). Reanimator with targets that doesn't self protect or have some ETB effect is tricky. But also more honest, so maybe it's the way to go.